(DEIR EZZOR) Since the early hours after breaking the siege imposed by Daesh (ISIS) terrorist organization on the city of Deir Ezzor in early September last year, the government in cooperation with civil society organizations and professional associations has been restoring the city and its countryside after years of terrorism. Several institutions and service departments are working to complete rehabilitation of the infrastructure of various sectors in Deir Ezzor in order to facilitate the return of all displaced families to their homes. This is being done within the context of an integrated work program implemented by the government to restore all basic services to the province. After the Syrian Arab Army restored security to the majority of the countryside of the province and secured thousands of kilometers of main roads to other provinces, the first sector that was rehabilitated in the province was the public and private transport sector. This was needed by the people of Deir Ezzor in order to return to their homes in the city's liberated neighborhoods and countryside. 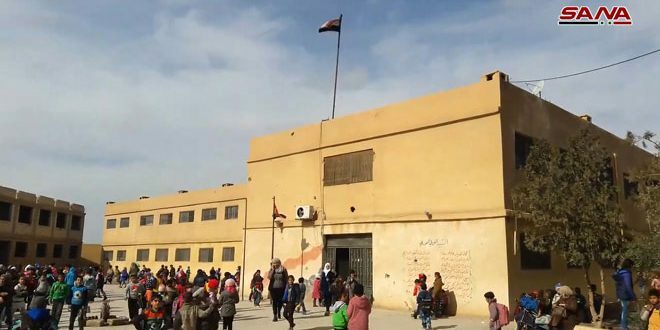 The number of citizens who returned to their homes in the province has reached 489,531 citizens since the beginning of 2018, putting the total number of residents at up to 1,037,037 inhabitants according to the latest statistics of Deir Ezzor governorate. The accelerated return of citizens to their homes has increased due to the efforts of the army units. The units have combed the cities, towns and villages to remove remnants of the terrorists and activated the work of police units, civil affairs, banks, post offices, fire brigades and municipal councils. This has been done in parallel with the start of reconstruction workshops to remove the debris, open the streets and repair infrastructure, including water and electricity. In the health sector, Director of the Health Department at Deir Ezzor Abdul Najem al-Obeid said that 26 health centers and two medical points were opened, in addition to al-Assad, al-Furat, the Children and Maternity hospitals which are providing health services to citizens. He added that the health sector in the province is supplied with medical equipment and devices, medicines, ambulances, and mobile clinics. Food was scarce under the siege imposed by Daesh on tens of thousands of people in the city of Deir Ezzor for almost three years. Food was secured a few days after the siege was broken through the convoys of the Syrian Trade Company. Food prices fell sharply and then returned to the normal level.